The museum was built to commemorate the life of Hugh Falconer, fossil collector, botanist and contributor to Darwin's theories of evolution. This Victorian gem is full of objects illustrating the history of Forres, one of Scotland's oldest towns. Exhibits tell the story of Moray's past from prehistory to the present day. 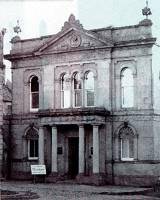 The Moray Museum service provides free family activities in the holidays, workshops for schools, community events and information on family and local history. Follow the brown Tourist Information signs to the museum, which is just off Forres High Street.Free car parking behind the museum in Leys Road car park.